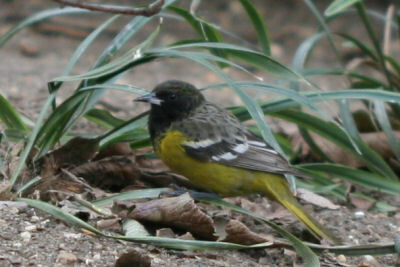 Previously brought to our loyal readers’ attention here, a Scott’s Oriole, normally a denizen of desert landscapes in distant places like Arizona and southeastern California, has decided to grace the citizens of New York City with its presence. And, as if a first state record of a bird wouldn’t be enough to convince me to go see it, I had the added incentive of never having seen a Scott’s Oriole before so if it would stay put for me to track it down it would be a lifer! Plans were made shortly after the bird, first discovered on December 4 of last year and misidentified as an Orchard Oriole, was well-photographed and properly identified this past Wednesday. I would be in New York visiting Daisy for the weekend anyway, and Mike definitely wanted to go birding so we contacted Carrie in the hopes of getting some guidance for the second part of our planned birding excursion in her home borough of Brooklyn. But I am getting ahead of myself here. First, a brief explanation that on Friday night Daisy and I were celebrating our friend Kerry’s birthday and didn’t get home until the wee hours. Nevertheless I was up before sunrise and walking to the Roosevelt Ave subway station before my body realized it was awake. The F train got me to within a couple blocks of Union Square Park and upon my arrival in the southwest corner of the park, near the Gandhi statue, I quickly got the bins on the bird, not because I have mad bird-finding skills, but because several birders were already present and pointing a dizzying array of high-priced optics at the first-year male Scott’s Oriole. As tired as I was I woke right up once the bird was in my bins! After watching it for a bit Carrie arrived and then we watched it some more. 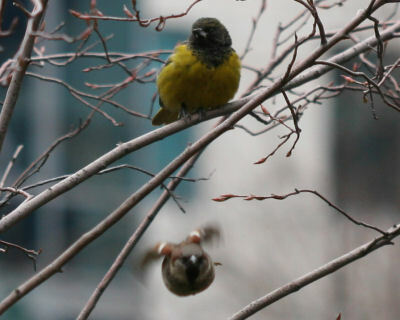 It was quite the aggressive bird, as any bird who makes Union Square Park its home must be, and showed no fear in driving off European Starlings and scaring a Yellow-bellied Sapsucker from its well-drilled wells. Union Square Park, as its many visitors know, is not the type of locale where one would expect to find any oriole, much less a rare species from the southwest. Normally, European Starlings, House Sparrows, and Rock Pigeons are the only avians present though lately both a Red-tailed Hawk and an American Kestrel have been preying on the three “trash” birds. 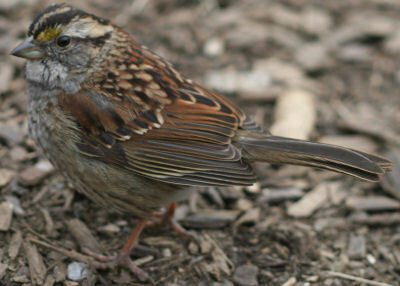 I was surprised, however, to note the large number of White-throated Sparrows present in the park, and even more surprised at how approachable they were. It seems like they’ve picked up the city birds’ nonchalance when it comes to humans. 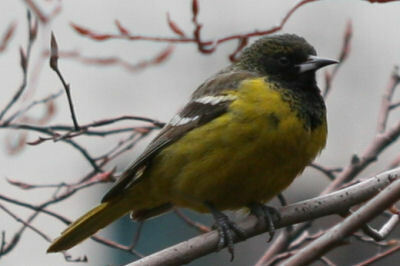 All in all, the Scott’s Oriole is a delightfully obliging bird, and I was glad to check it off my state and life lists. So glad, in fact, that after Mike arrived and saw the bird, and after we went off exploring Prospect Park in Brooklyn I went back for more! It was great fun to be at an urban park with a bunch of birders from all over the state with curious passersby getting into the idea of a rare bird in Union Square Park. “Scotty,” as birders have dubbed him, looks to be doing all right and barring a prolonged cold snap the hope is that he will survive and migrate back to the southwest to mate. Like most tourists, he probably finds New York nice to visit but he wouldn’t want to live here! 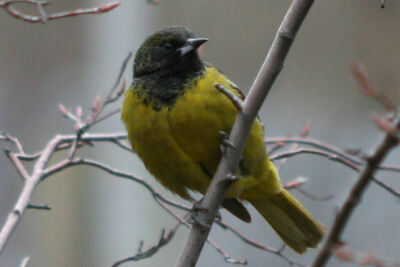 We have the white throated sparrows here ..not a lot but a few and the Oriole is a beatiful bird. It’s an Escape or hitched a ride on a plane (is my guess). Nice! I figured you’d be chasing that bird. I have been hearing about this bird and so glad that it was found! Those photos are stunning and also love the Sapsucker in helping telling the story! @Will: Always hatin’ on the rarities…thanks about the pics though. @Nathan and Nick and Monarch: Thanks! And Monarch, I’m just glad that in addition to the bird being found, pics were posted online so the bird got properly ID’d. I imagine that before the internets this bird would have never been figured out. Glad you got to see such a great bird. I hope one shows up in CT so I can see one too! 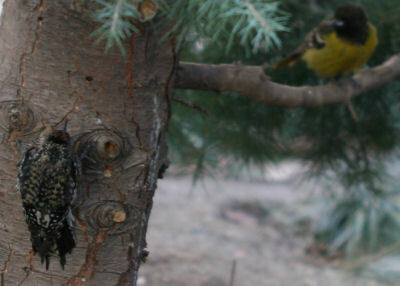 It’s good to know that the oriole was able to take care of itself while around other birds – good job getting photos! Crap… I need to get over there. My schedule has not been kind. And this weekend is no good… ugh.